A common theme that developers often face is deciding which platform they should make their apps available on next. Are the users on this platform engaged enough? Will I be able to make money on this platform? These are only some of the questions that developers face, before investing their time on transferring their apps. For Playtika, a company which builds highly immersive social games, expanding their apps onto as many platforms as possible has become a core strategy. 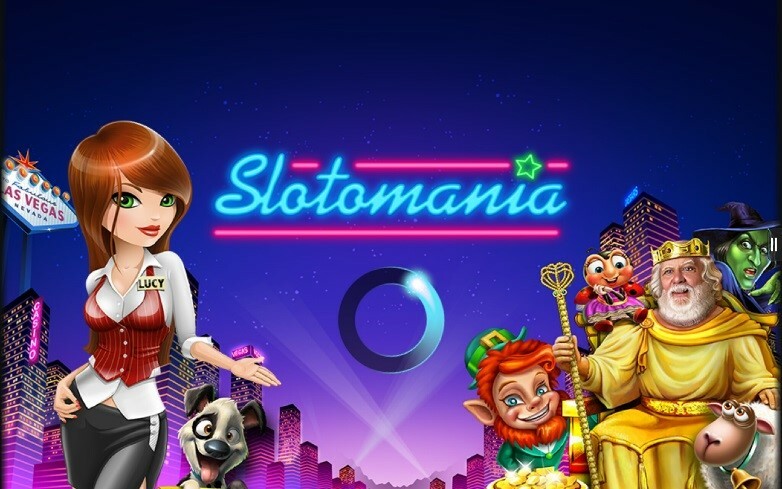 Playtika’s app Slotomania currently holds the #8 spot worldwide for highest grossed mobile app on iOS and Android. In addition to iOS and Android, Playtika has also launched on the Amazon Appstore, which has proved to be a big success. 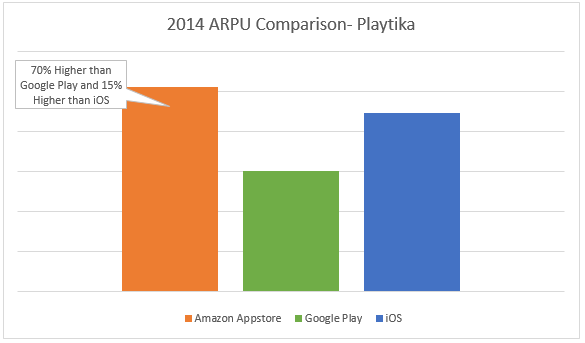 According to Playtika, the Amazon Appstore provided the team with the highest ARPU (average revenue per user) compared to other platforms and also contained the highest retention rate amongst its competitors. Recently I had the chance to sit down with Elad Kushnir, VP of Business Development, to discuss how their apps were doing in the Amazon Appstore and their experience working with Amazon. The team credits the unique audience that Amazon brings in and how engaged they are. “When we looked at retention rates for 2nd day and 7th day metrics, the retention was relatively the same across all platforms. However on the 30th day, retention on Amazon Appstore was 10%-20% higher than on iOS and Google Play.” Says Elad. Getting users engaged is only half the battle. With a free app like Slotomania, conversion rates (paying users/ DAU) is crucial in terms of making revenue which is why Playtika is using Amazon’s In-App Purchasing API. So how many of these users are actually purchasing within the game? 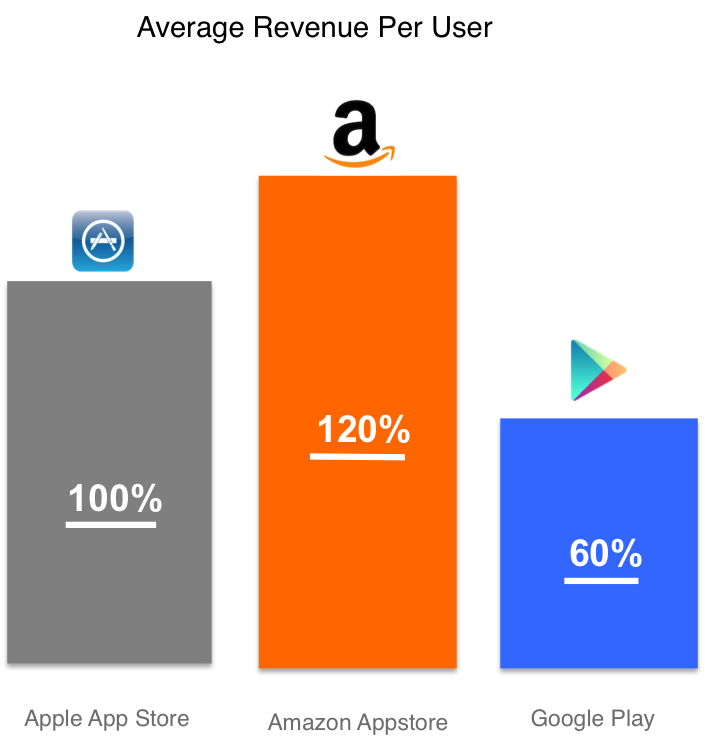 From Playtika’s data in 2014, they determined that the average user on the Amazon Appstore is 150% more likely to become a paid user than on iOS and 170% more likely than Google Play. When the team came together to decide on their next platform, they chose the Amazon Appstore immediately. So why did the team decide that Amazon Appstore was the right choice? From previous tests, we actually found out that more than 75% of the Android apps we tested just work on Kindle Fire with no additional development required. The team has now launched several of their games on the Amazon Appstore and are working on the getting the remaining ones up and running within the next year. Moving forward Playtika plans to take their apps to the next level by getting them onto Amazon’s newest devices. Their current focus is to get their app on Fire, in which their team is already planning on integrating Fire’s exclusive feature, Dynamic Perspective. In 2015 Playtika is planning to also have their apps on Amazon Fire TV. For now, the Playtika team tells us that they are very happy with how things are going and plan to release even more apps on the Amazon Appstore in the near future. In-App Purchasing (IAP) is gaining in popularity with developers as it continues to be a reliable revenue generator for mobile apps and games. It is the basis of Free-to-Play, eliminating up-front costs but allowing customers to purchase upgrades and add-ons they find valuable. The Amazon Appstore platform is designed to manage these transactions, and we have enhanced our In-App purchasing API to make it easier for you to manage the purchases your customers make. With this update, the In-App Purchasing API improves the receipt process to provide better visibility into the fulfillment status of your customers’ in-app purchases. Determine fulfillment status and reconcile transaction records with your Amazon earnings report. Identify duplicate transactions to prevent over-fulfillment of digital content. Receive notification of transactions that cancel orders. The updated API is backward-compatible, which means that your existing applications will continue to work without modification. We recommend that you migrate to the latest version, though, so that you can benefit from these improvements. If you are adding in-app purchasing to your app for the first time, simply build your project with the Amazon Mobile App SDK, which includes the latest version of the In-App Purchasing API. If your app already uses an older version of the API but you’re not ready to migrate from PurchaseToken to ReceiptId, you can still update to the latest version. Your app will work without modification, so you can prepare for the switch and follow through with the actual migration when you’re ready. If you are ready to use ReceiptId now, simply follow the migration guide available on our Developer Portal. For more details on in-app purchasing and how to implement it in your mobile projects, check out our Developer Portal and blog. Dive deep on the new API, or explore related topics such as increasing conversion, digital item sales in desktop and web-based applications, and managing promotions and discounts. Launched in 2010, Soundtracker by South Ventures USA, is described as an app that allows music to connect people by making it easy to discover and play music in real time with friends and anyone nearby. 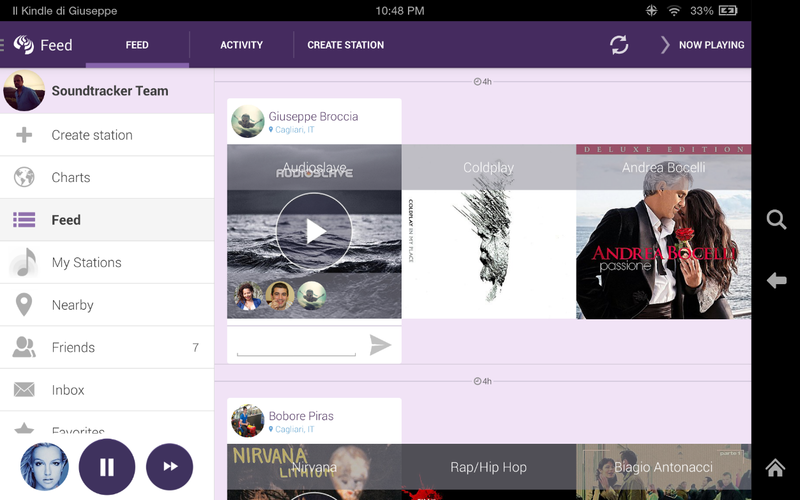 With Soundtracker you can create stations, chat with other users, listen and comment on their latest stations amongst other features. Available on the Amazon Appstore here as well as other platforms, Soundtracker has over 4 million downloads and 1 million active users worldwide across all platforms. I had the chance to sit down with Daniele Calabrese, CEO and founder, to discuss their experience bringing Soundtracker into the Amazon Appstore and how they’ve managed to leverage different Amazon Mobile Apps APIs to their advantage. Besides using Amazon’s In-App Purchasing and Mobile Ads API, Soundtracker also uses Amazon’s Maps API and Device Messaging API as well. For Soundtracker “being able to monetize and engage your users are the most important factor in choosing a platform” says Daniele. The team credits these specific API’s as “the reason why we were able to be so successful in the Amazon Appstore.” By integrating certain APIs you can also qualify for different programs. Daniele says the team is “excited to be admitted into the Appstore Developer Select program,” which provides the team with 500k mobile ad impressions, Amazon Coins rewards to customers, and more. Since Soundtracker detects where other users are, relative to their current location, notifying other users who are nearby is crucial for engagement. The team decided to use Amazon Device Messaging API and Amazon Maps API to help solve this issue. The device messaging and maps APIs allow users to really engage by integrating interactive maps directly into your app, as well as sending out push notifications from the cloud to the user. 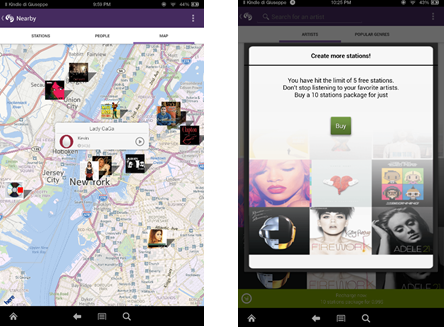 When your app relies heavily on social interaction, such as Soundtracker’s feature of commenting or discovering other users’ playlist selections, getting a user’s attention is one of the most important factors. By using these APIs, the team was able to see a consistent lift in engagement. So how long did it take for the team to integrate all these APIs? Daniele says “the process for development and testing altogether took only a week and the process was very straight forward”. According to Daniele, “since performance has been successful with their current app on Kindle Fire” the team plans to expand even more into the Amazon ecosystem. The next step for the team is “integrating with Amazon’s music offering and getting their app on Amazon Fire TV.” Since the team has already qualified for Appstore Developer Select, the team can now qualify for the Appstore Developer Select Amazon Fire TV benefits as well by optimizing for the Amazon Fire TV. This includes enhanced on-device merchandising and a 500k Amazon Coins offer per qualifying app. This quick video will give you an overview of the Amazon In-App Purchasing API. It will cover how to get started, offer advice on popular In-App items and categories, and cover the process for creating your own In-App SKU catalogs. Whether you are completely new to In-App Purchasing, or have existing items for sale on other Appstores like Google Play, this video will help point you in the right direction. 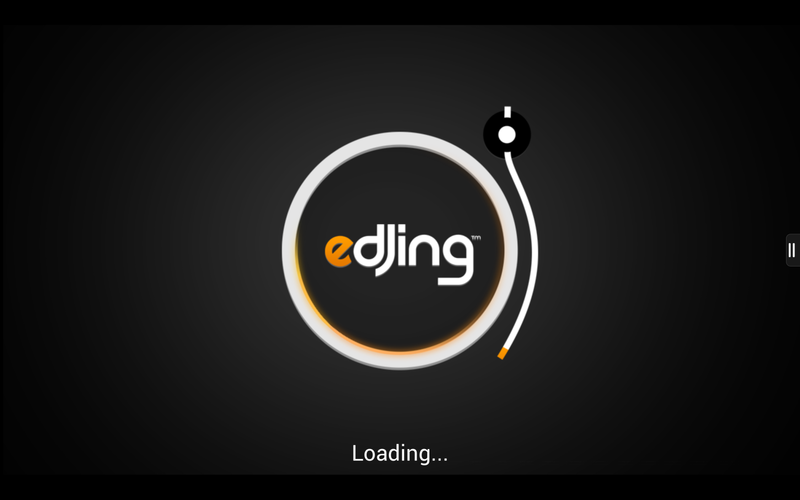 Launched in 2012, publisher DJiT describes edjing as the first and only multiplatform track-mixing application on the market. With edjing, customers have been given the opportunity to mix like a professional DJ, record their tracks, and numerous effects and then share them out with friends. Available on the Amazon Appstore here and other platforms, edjing has already registered more than 15 million downloads and is available in more than 170 countries across iOS, Android, Windows and Amazon. I had a chance to sit down with Jean-Baptiste Hironde, CEO of DJiT, to discuss their experience bringing edjing into the Amazon Appstore ecosystem, what they’ve found Amazon customers like about their app, and what type of success they’ve seen. The process of updating the existing Android version of edjing for the Amazon Appstore was a simplified one and done by a single developer on the team. “We have been very pleasantly surprised on how easy it was to port the app over to Amazon. We only had few modifications to do in order to adapt to the Amazon environment, especially concerning the In-App Purchases. We just simply had to match our existing In-App Store SKUs with Amazon’s.” recalls Jean-Baptiste. Amazon’s free In-App Purchasing API allows publishers to sell digital content and subscriptions—such as in-game currency, expansion packs, upgrades, magazine issues and more—for purchase within their mobile apps and games. 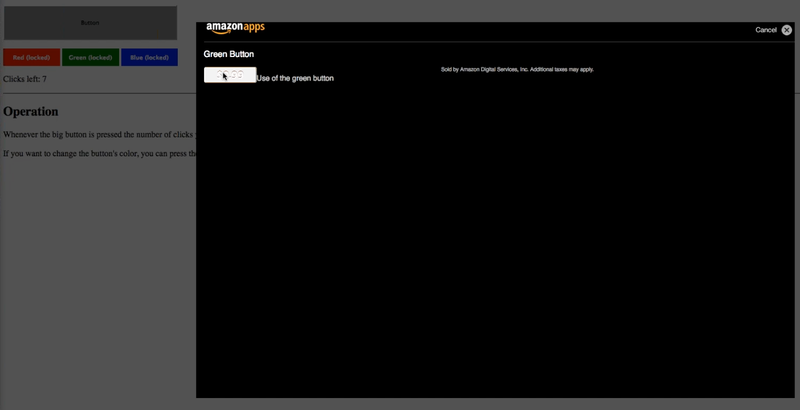 It includes a fully integrated checkout experience with the Amazon 1-Click settings customers are familiar with. Edjing chose to have a Freemium business model for the initial release. The app was downloadable for free but customers could buy additional features as in app purchases via the edjing in-app store. 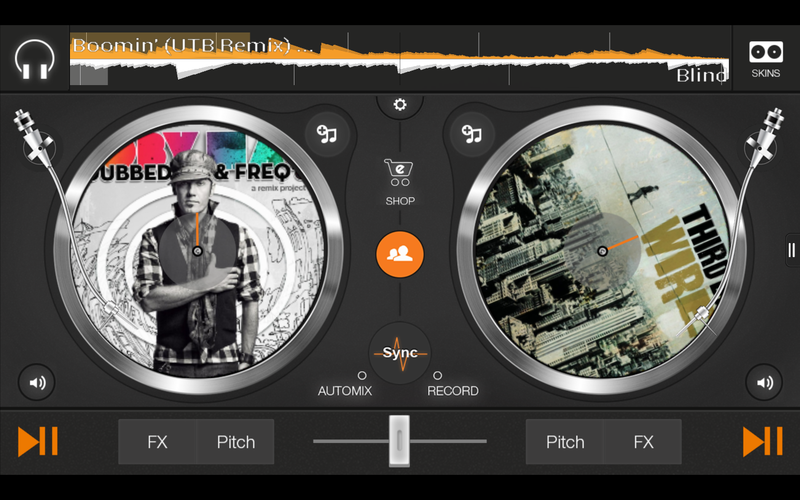 Currently this includes selling additional sound effects as well as customizable turntable backgrounds. The Freemium version also implemented an offer wall within the app, to help offer purchasing options to customers who had not bought anything yet. Based on the success with the Freemium model a Premium version of edjing was released. “Amazon monetizes very well, therefore we’re currently offering a Premium version. We actually noticed that though the volume of downloads might be lower than on other platforms, the Average Revenue Per Download (ARPD) is actually much higher than on Android." says Jean-Baptiste. Soon after being launched edjing was also featured in the Amazon Appstore. According to Jean-Baptiste after being featured, the average daily downloads on the Amazon Appstore for edjing increased by 400% during that time. Edjing has also seen a stronger engagement than on competitive platforms. “Amazon users are very qualitative users. User engagement with edjing on Amazon is higher than on any other platform. In proportion, Amazon users spend more time in edjing than any other platform. Close to 25% of edjing for Amazon sessions exceeds 30 minutes! “In summary, it is so easy to port the app on Amazon that there’s no reason you shouldn’t!” concludes Jean-Baptiste. You can check out edjing today in the Amazon Appstore including both free and premium versions. 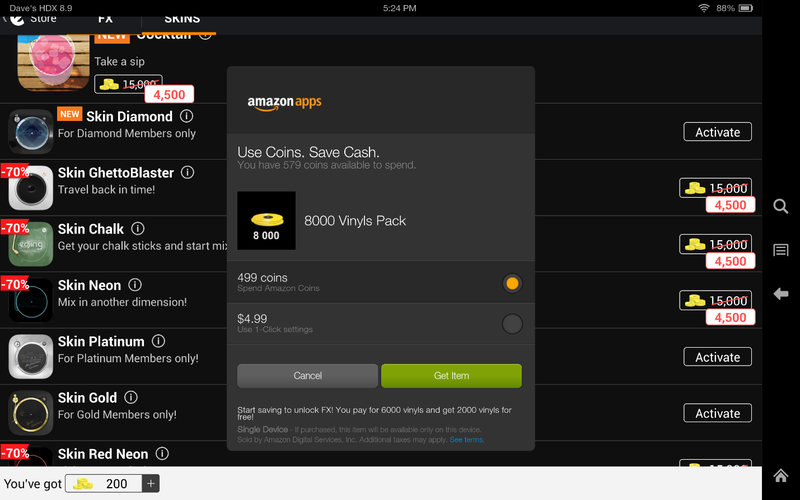 You can find out more about the Amazon In-App Purchasing API here. In a previous case study, you heard about the tactics that Big Blue Bubble uses to monetize their free to play (F2P) games. 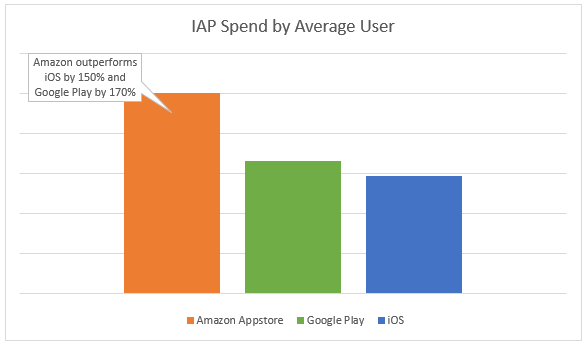 In this study, we’d like to share how June Software increased their app exposure by going from an iOS-only producer to an iOS and Android platform producer, and how their presence in the Amazon Appstore has racked up higher Average Revenue per User (ARPU) than any other app store. June Software is a small San Francisco based software company founded in 2008. They build casual, arcade games and e-learning games for children. Initially June Software only built games for iOS where they have titles such as Math vs. Zombies and Guess the Movie, which is ranked #3 worldwide and is #1 in Australia. To grow their customer base, June Software decided to address the Android marketplace. June chose to port their iOS games to Android using Unity. Unity allows them to build their app once and deploy it to multiple app stores, including the Amazon Appstore. One effective strategy that Saurabh implemented is that they have integrated Amazon IAP and GameCircle features in their games, which increased potential revenue and player engagement. GameCircle includes features such as leaderboards and achievements that keep players engaged and can increase user session time and session frequency, giving uses more opportunities to make IAP purchases. And it works on Android and iOS. This is exactly what June Software needs for their games available for both platforms. To learn more about using Amazon GameCircle in your Unity apps, read this blog post and refer to this documentation. 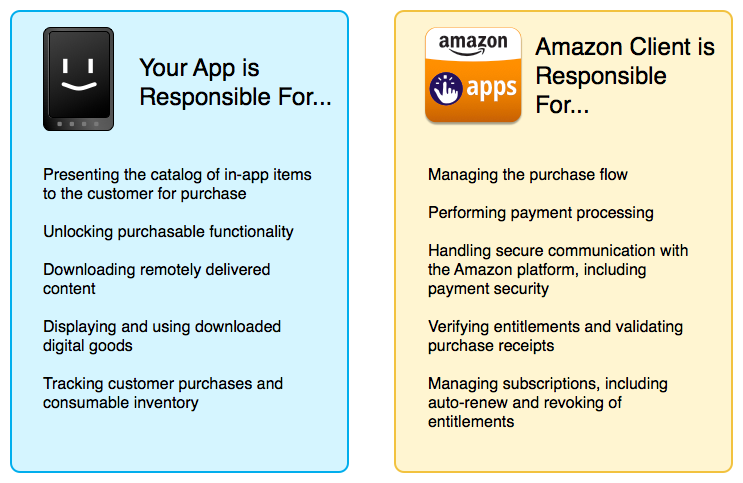 To learn more about using Amazon In-App Purchasing in your Unity apps, read this documentation. 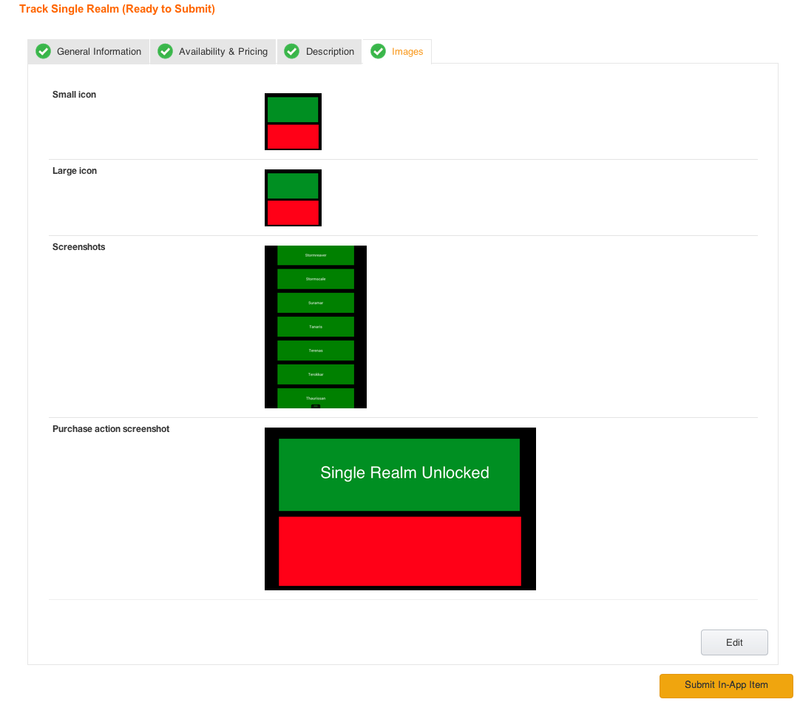 To see how Mad Menace Games used the Amazon IAP Plug-In for Unity, read this post. For additional information on Amazon Unity Plug-ins, read this. The first step in implementing In-App Purchasing in your web apps is to download the Amazon Mobile App SDK, then you will submit a new web app to the portal and then finally add a reference to the Amazon Web API libraries in your html. The latest versions of the Amazon Web API libraries are hosted by Amazon for you. 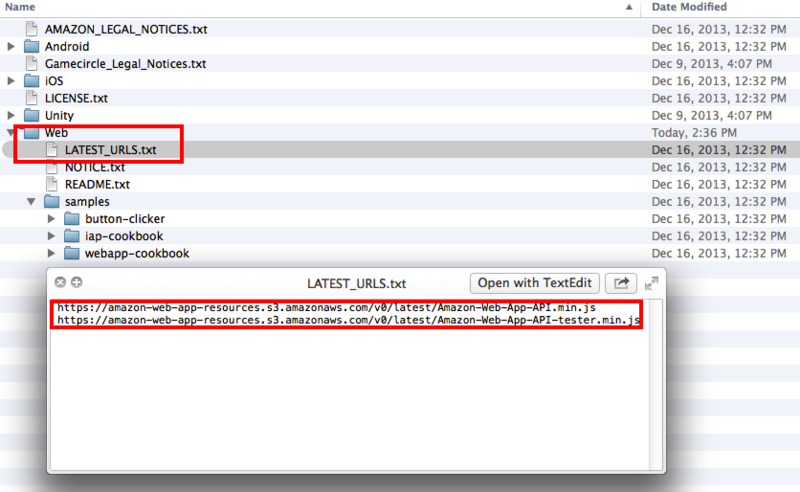 The current urls can always be found in the LATEST_URLS.txt file located in the Amazon Mobile App SDK folder. Before you can make any In-App Purchase calls you need to have a catalog of SKUs set for your web app to use. You can add SKUs to your web app’s catalog by opening the Developer Console, selecting Apps & Services, choosing the web app submission you want to add SKUs to and then clicking on the In-App Items link, which will take you to the list of SKUs currently offered in your web app. There are three types of SKUs you can offer to your customers. · Consumables – This type of purchase is available only on the device it was purchased on. 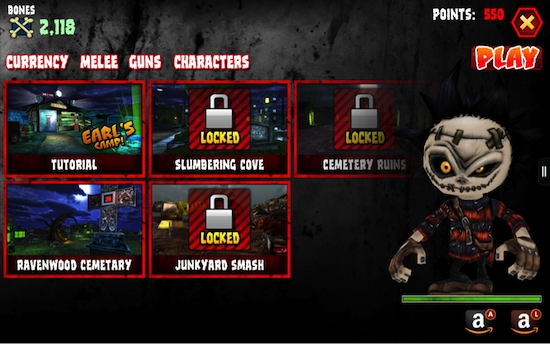 Some consumable examples include in-game currency or an extra power up in a game. · Entitlements – This is content that requires access rights such as unlocking additional game levels or offering specific magazine issues. Entitlements do not expire, are tied to a customer’s Amazon account and are available on any device they access the content from. · Subscriptions – These are entitlements that are bound by a period of time which auto-renews at the end of the period and is tied to the customer’s Amazon account. 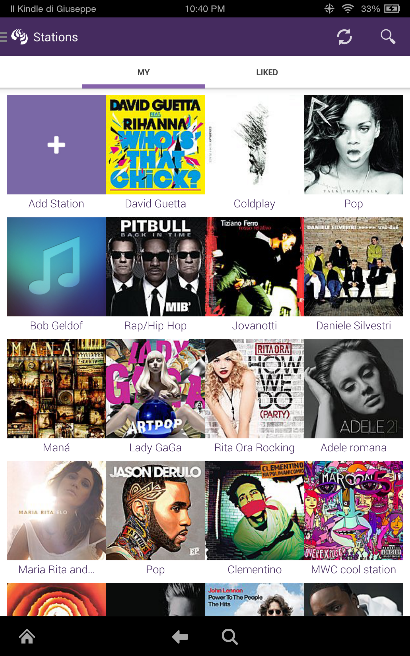 Subscriptions are available on any device a customer accesses the content from. You are allowed to have multiple subscriptions for purchase within your app. Simply click on the type of SKU you would like to add and you will be taken to a new screen where you can provide information about the SKU. 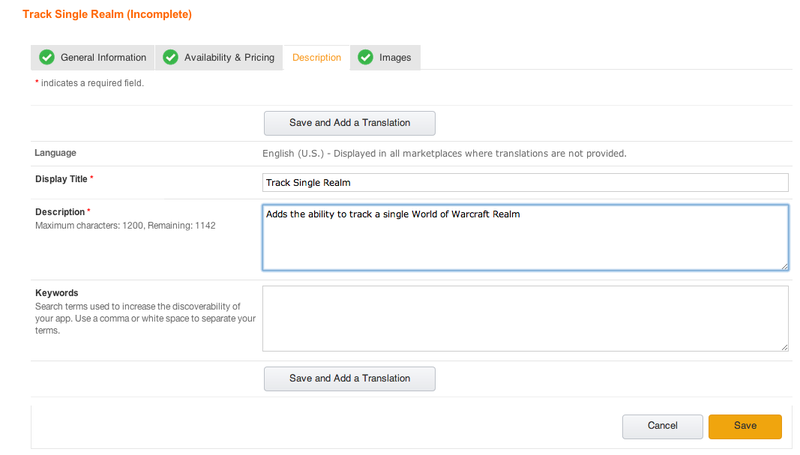 For example, if I wanted to offer an Entitlement purchase for my World of Warcraft Realm Status app to track a single realm I would click Add an Entitlement and then enter a Title and SKU. Next you will need to enter pricing information for your new SKU. In this case, I want to sell a Track Single Realm for $1.00. Amazon gives you the option of setting your own list price for each marketplace or it can match the prices based on your entered base price. You can also enter a detailed description, along with keywords for the Entitlement. Descriptions can be provided in multiple languages and if no translations are given the default English description will be used. You also need to provide images of the item for users along with the image you want displayed upon a successful purchase. Once you have completed this, click Save, and then Submit In-App Item. You will be taken back to our In-App Items screen with the new SKU now listed. In the upper right corner will be a button to download a JSON Data file. This JSON file will include a list of our SKUs that will be used by the SDK Tester Tool when we want to simulate a purchase in our development environment. The SDK Tester Tool is included in the Amazon AVD Launcher emulators or it can be installed on a device via the APK included in the Amazon Mobile App SDK under the /Android/InAppPurchasing/tools. 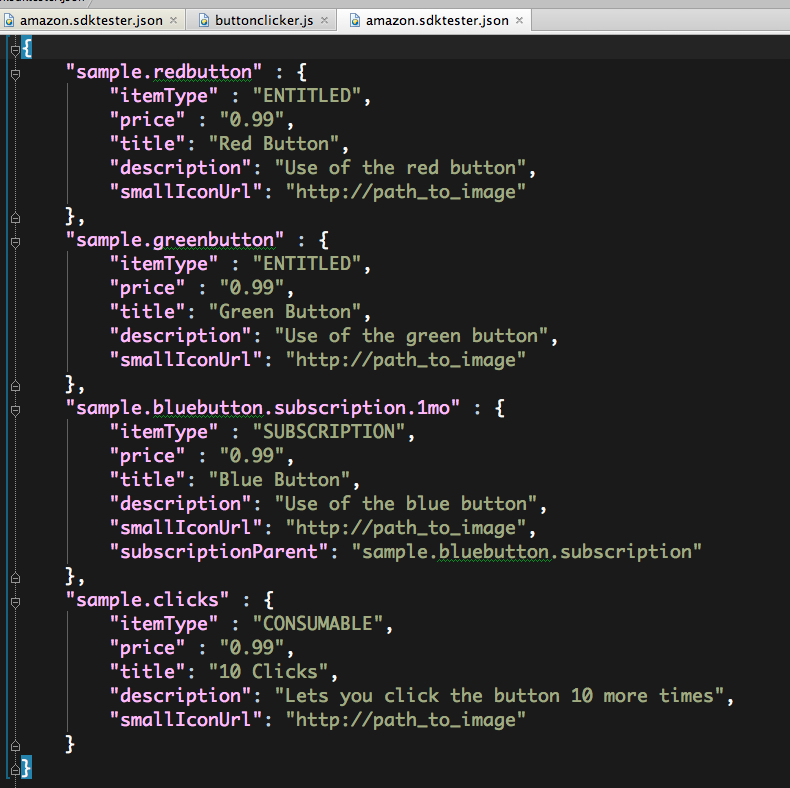 The Button Clicker example includes a similar JSON file that covers all of the purchasable item types. Below is a simplified chart explaining responsibilities during the purchase flow. Receipt Verification Service - An HTTP service you should use to validate the customer's purchase receipt. PurchaseUpdatesResponse - Provides a paginated list of receipts and revoked SKUs since the offset passed into the initiating request. Receipts are returned in a set and are unordered. ItemDataResponse - Provides item data, keyed by SKU. PurchaseResponse - Provides status on purchases initiated within your app. Any error for a purchase is automatically managed for you by In-App Purchasing API. onSdkAvailable(onAvailableResponse) - This gets called when the In-App Purchasing services are ready to be called by your code. Production applications should not grant entitlements when they are run in sandbox mode. onGetUserIdResponse(userIdResponse) - Called in response to GetUserId. onItemDataResponse(itemDataResponse) - Called in response to GetItemData. data.itemData is a hash table of itemData objects keyed by SKU. onPurchaseResponse(purchaseResponse) - Called to report the status of a purchase operation. purchaseResponse.purchaseRequestStatus contains the status of the response. If a prior session of the application shut down before a purchase response could be delivered, this function will be called when a new session of the application registers a purchase hander. onPurchaseUpdateResponse(data) - Called with the list of entitlements that the user has been granted. data.receipts contains a hash table, keyed on SKU, that contains the receipts for the IAPs that have been granted to the user. data.revokedSkus has a list of SKUs that the user can no longer use. For example, the Button-Clicker example starts off by calling an initialize() function which will set up an IAP observer using amzn_w.IAP.registerObserver() and then checks the response object to see if the web app is in debug mode. If it is an alert box is generated telling the user the app is in development mode. If not it will check for updated Purchases. Finally, the function sets up handlers for Purchase Response and Purchase Updates Response objects. 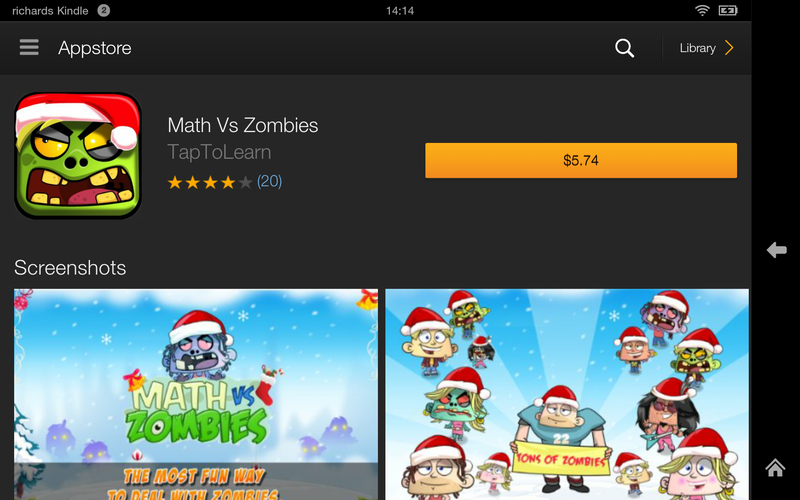 // from the Amazon Appstore. 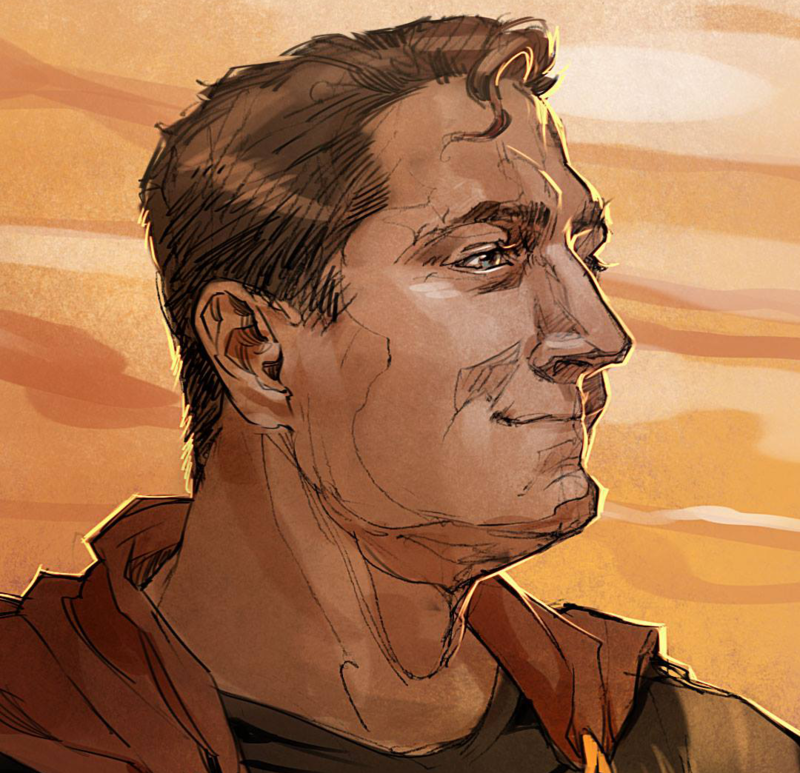 // that could have been made in a previous run. Once initialization is done you can make purchase calls by passing in your SKU title. The example code here is making a call to purchase the more “sample.clicks” SKU. The purchaseItem function will return a response object you need to handle and check for success or failure. In this Button-Clicker example we are setting a Boolean value to true based on a successful purchase. In a real web app you would want to save the purchase receipt to local storage or back to your own cloud storage so you can verify purchase receipts in the future. If you are running in the development Sandbox Mode we mentioned above calls to the Amazon Services will go through the local SDK Tester App instead of to the Amazon Cloud. In this scenario you need to ensure your JSON file holding the SKUs is located in the same folder as you web app. If you want to test the In-App Purchase on a device you can do so using the SDK Tester tool and a JSON file that has been copied to the SD Storage. For a complete video walkthrough of the purchase process and SDK Tester tool you can watch the following screencast on our Youtube Channel. Be sure to check out our HTML5 Web App materials on the developer portal to get started today! Adobe AIR Native Extensions for the In-App Purchasing and GameCircle APIs are now available for mobile app developers. If you create your mobile games using Adobe’stools, you can now use these extensions to rapidly add both In-App Purchasing for virtual goods and GameCircle for leaderboards, achievements, and Whispersync for Games. 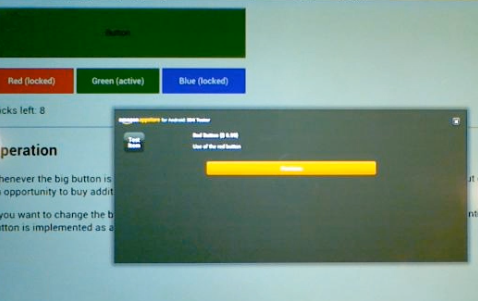 The Adobe Gaming SDK enables developers to package ActionScript code into native apps for Kindle Fire, along with other devices. The Gaming SDK and the Adobe Game Developer tools are designed to help developers create rich,interactive experiences expertly and efficiently, supporting popular features such as hardware-accelerated graphics. The new AIR Native Extensions are available today for free as part of the Amazon Mobile App SDK. You can download the latest version here. Just follow the simple instructions in the documents to get started. Of course, you’ll also need AIR in order to use the extensions.You can learn more about the Adobe Gaming SDK and Adobe Game Developer Tools here. We’re excited to announce a new tool for developers called the Developer Promotion Console (DPC). DPC gives you a self-service way to manage the pricing of all your apps with pricing campaigns. Want to run a 24-hour special holiday sale or discount all of your apps to celebrate the launch of a new game? It’s now much easier. The Developer Promotion Console is available just in time for the holidays and it’s a great time run a special offer. In 2012, we saw a 50% increase in the number of app downloads during Thanksgiving week as compared to an average week. During ‘Digital Week’ 2012, the week after Christmas, customers purchased and downloaded 600% more apps than any other week during 2012. DPC allows you to create campaigns that run from 24 hours to any amount of time you choose, up to a maximum of 27 consecutive days. 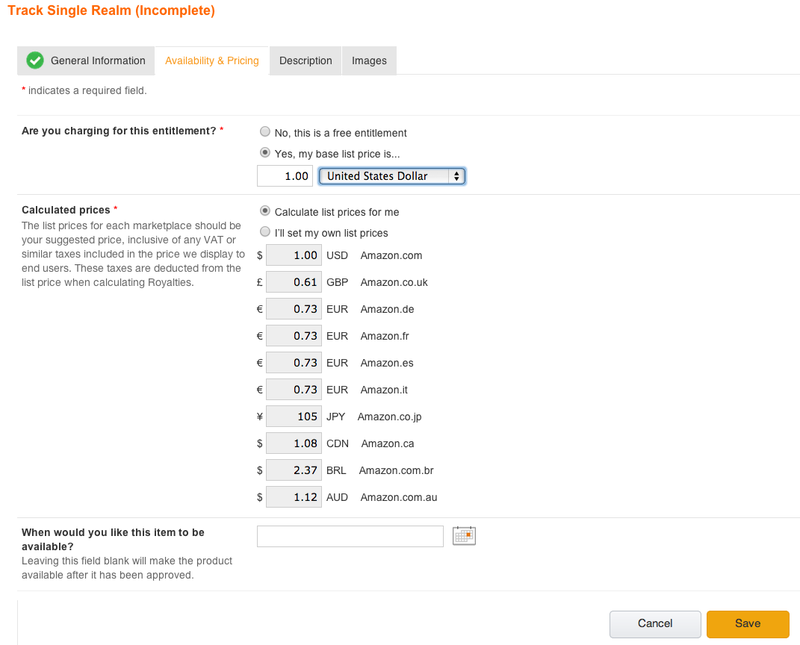 Pricing is worldwide so you can set discounts by Amazon marketplace. Best of all, you can run campaigns for the price of your mobile apps and any of your mobile in-app items. 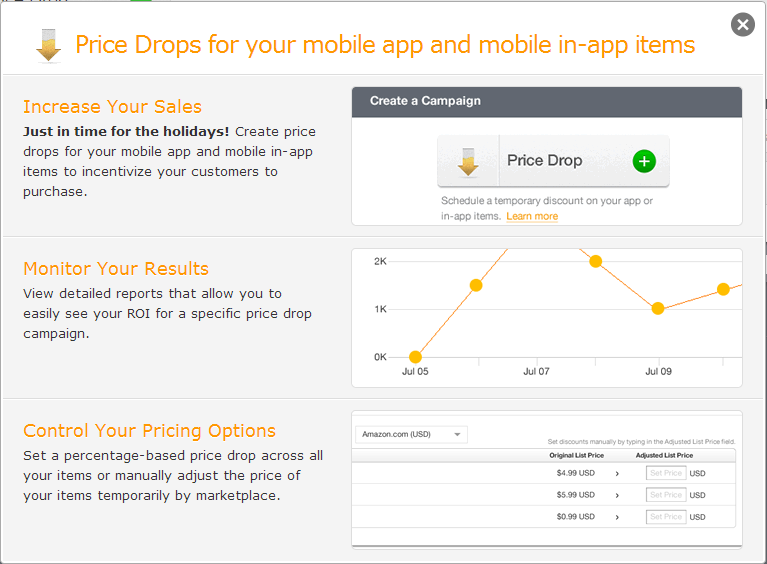 Set temporary price drops: Create price drop promotions for your mobile apps and mobile in-app items to incentivize your customers to purchase your products. 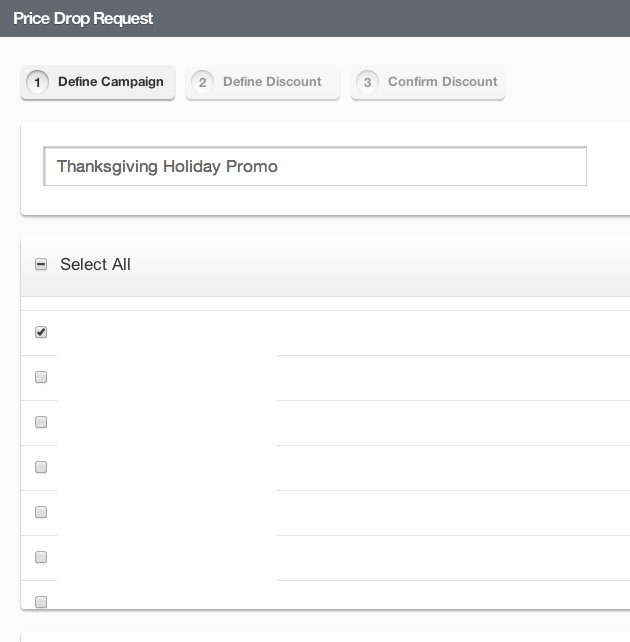 Reporting: Easily view your ROI during your price drop promotion. 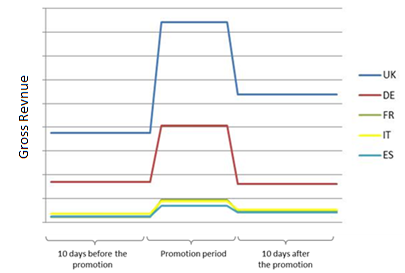 Compare the performance of your promotion with your performance prior to the promotion. Ease of use: Creating a price drop promotion is simple. Typically, it will take no more than five minutes and three steps to go from start to a scheduled promotion. 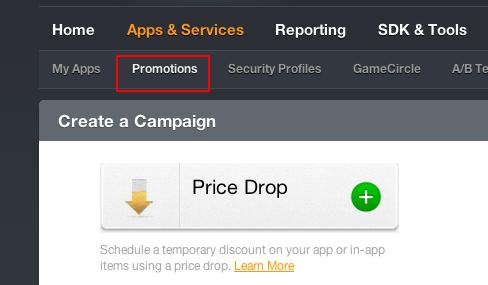 Inside of the developer console, you will see a new tab called ‘Promotions.’ Clicking on the tab will display a new button to create a ‘Price Drop,’ as well as a list of your existing campaigns. You will be able to set a discount for any of your apps and in-app items available for purchase. For this example, we are going to create a new campaign for one app and set a price discount for the upcoming Thanksgiving holiday. We start off by giving the campaign a name, in this case the ‘Thanksgiving Holiday Promo’, and then selecting the app (currently blocked out in the image for privacy reasons) that we want to include in the promotion. 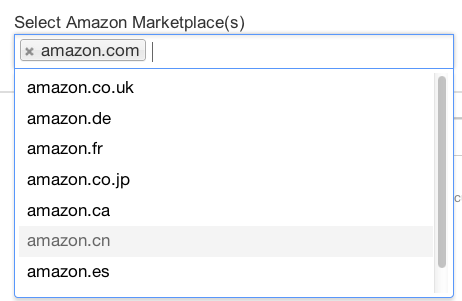 We then select the Amazon marketplaces we want the campaign to run in. Since Thanksgiving is a US holiday, we will only run it in the amazon.com marketplace. Next, we can choose the dates for our campaign, with the minimum being one day and the maximum being 27 consecutive days. We are going to run this campaign for Thanksgiving Day only, on November 28, 2013. We then click ‘Next’ and define the discount we want to apply to our app. We are going to do a 50% off sale with the price being rounded to the nearest 9. Selecting the amazon.com marketplace from the dropdown shows us that the list price for our app will go from 2.99 USD to 1.49 USD when the campaign is active. Again, note that the app name in the above screenshot has been hidden in this example for privacy reasons. Clicking ‘Next’ will give us a final confirmation of our campaign’s details. We have the ability to edit any of the sections before hitting ‘Submit’. We’re finished. Our campaign is now ready to run on Thanksgiving Day in the amazon.com marketplace, where our app will be available for sale at 50% off. How much did we increase sales? Rather than guessing if we made more money with increased sales at a discount, the DPC reports will show us our net results of our campaign sales compared with our normal app pricing. To view the results of the campaign, we just click on the ‘Promotions’ tab again (the same one we used to create our campaigns), and we will see a list of the campaigns that have run or are planned. In the above example, we can see that we ran a campaign from October 29th through November 3rd (campaign name hidden for privacy reasons), and we have the option to click ‘View’ to see the results of that campaign. We can see that during the campaign period, we sold 21 units of our app at 50% off. The ‘Effect’ column takes the guesswork out of the ROI for our campaign and gives us the net results. Based on sales during the period of time before the campaign ran, we have increased our revenue for the period by 84%, resulting in a nice boost. We can also click on the CSV icon, which will create a detailed view of daily sales during the campaign period and compare them with previous run rates. The new Developer Promotion Console helps you manage discounted pricing which can lead to increased sales and customer engagement. Creating a new campaign is easy through the Developer Promotion Console, at no cost to you. With detailed reports that will show you the ROI of your campaign, you can feel more confident experimenting with discounts on your apps and in-app items. Another follow-up in the series of webinars covering Amazon devices, services, and mobile applications, here’s a list of questions we collected during and after our presentation on the Amazon In-App Purchasing API. Q: How does amazon recommend implementing restoring IAPs for device re-installs or multiple devices? Q:Can I host website files on S3 for app program? How will only legitimate app purchasers access the website? Mobile app program needs more info/examples. e-book publishers can't relate. A: Yes. IAP does not care where entitled content is fulfilled from. You can fulfill content from an S3 server. Your app would be responsible for validating entitlement or active subscription for currentUser, and then pulling down the S3 content and granting currentUser access to that data. Q: Could you show how it looks visually in some app? Q: I mean specific recommendations implemented inapp purchases with ANE. Q: Can one test in-app purchases through emulator? Q: Anything specific for Adobe Air ANE? Q: We are looking to restore saved game data using the userID, is this a sensible use for the ID? If so what is the maximum length of this string, does it contain only ASCII characters? A: Good question. We recommend using the userID (player name and alias) from the GameCircle API. Using this, you can not only get an identifier for saved game data, but you can also sync game state, store high-scores and register achievements. If you don't want to use GameCircle, getUserID will return an app-specific ID of the currently logged in user, meaning the result will be different for different apps, even on the same device. The UserID will, however, always the same for the same package name, even across devices. Q: Is there any way we can test a real IAP before launching the app? We have been bitten by minor differences between IAPs made in dev and production environments in the past. A: Unfortunately it is not currently possible. Q: We submitted our app, but we are told the app crashes, but no device logs are provided to help us identify where it is crashing…how could we get device logs when a crash it detected? Q: Can you also add a few more samples of html5 code for us to check so that we know our content will work on multiple devices. Q: Will the emulator work on my desktop? Q: For apps that are html5 with css, you mentioned on Aug 7th press release that we could take mobile websites and turn them into apps. How do I set that website so that it is secure to purchasers? A: We have a quick security overview here: https://developer.amazon.com/sdk/webapps/webappsecurity.html. More detail should really be provided on a case-by-case basis with a developer. Q: Will you accept a .htmlz file? Or only html5? A: They way you submit a web-app is by putting a manifest.xml file at the root of your web app and submitting the path to that manifest, so submitting a file is not required. Q. We submitted our in-app billing application, but it keeps getting rejected because of various reasons. We are not receiving any device log, so it complicated to debug and resolve. Q. When we complete an IAP item in the dashboard do we submit it before we submit the app or at the same? A. Entering the IAP items in the developer portal before or at the same time is okay. It's not okay to wait for some time after the app is submitted to add your in-app purchase items to the portal. on September 17th, 2013 @ 10:00 AM PDT. "The $2.87 eCPM we saw through Amazon far exceeded our expectations. Now we're racing to get Amazon integrated in all of our apps across all Android stores," says Mahesh Khambadkone, Co-Founder of Games2Win. See how Games2Win uses the Amazon Mobile Ads API to increase their earning by 733% on their Kindle Fire apps with eCPM up to $2.87. Click here for more monetization tips. As I was reviewing our catalog of blog posts and thinking about blog posts we should write in the coming weeks, I was impressed by the number of ways Amazon helps developers monetize their apps. I thought it would be a good idea to recap those here! To learn more about the items above, please continue reading below. No development effort is required to take advantage of Amazon’s reach. • In nearly 200 countries - The Amazon Appstore is available in the hottest app-buying markets in the world. • The only store on Fire - The Amazon Appstore is the only app store on Kindle Fire, the best selling Android Tablet worldwide. No development effort is required to take advantage of our programs, but you do need to sign up for Free App of the Day. • Free App of the Day – Just tick the checkbox when submitting your app and you will be considered for the program. • Test Drive – By removing friction for customers who want to try apps, the more apps they will try. Those customers are more likely to find apps they are excited to download. In this way, Test Drive helps customers understand the value of premium apps and helps drive downloads of freemium apps. Since Test Drive launched, it has been enabled on over 16,000 apps. • Personalized Recommendations – Increases the chance that your app will be seen by its most likely buyers. Development is required to make money with our APIs, and we’re working hard to make that effort as easy as possible. These are the APIs I’d like to talk about now. Selling lasting items: If you have an app in which users need ownership of something durable, say, a new sword for their dungeon crawler character, you would use an IAP entitlement transaction. If you have a productivity app that has a set of advanced features you want to sell at a premium, you don’t need to have a free and a paid version of your app in the appstore; you need only one free version with an IAP entitlement inside to purchase access to the advanced features. Delivering content or value over time: You could even collect $0.99 every month for the advanced features of your app if your users would rather subscribe to advanced features. For this, you would use the subscription IAP item. Access to advanced features would be available while the subscription was active, and inactive otherwise. You can also use subscription IAP items so a user can subscribe to a stream of entitled items like magazines. As long as you are subscribed, you get issues that you become entitled to even after your subscription ends. Consumable items: If you have an app in which the user spends game currency, you would want a consumable IAP transaction. In a consumable IAP transaction, users get a set quantity of something, usually power-ups, hints, un-do actions or coins that they consume during play. Once they are out, they can buy more. Mobile Ads: If you want to collect revenue by displaying ads on your site, then the Mobile Ads service is for you. You can display a traditional banner advertisement (anywhere on your screen above the fold), you can display expandable interactive ads, and you can even pop up large views displaying our largest ads for an interstitial ad experience. Mobile Associates: If your app is a natural compliment for a physical good, then you will like the Mobile Associates program and API. If, for example, you have a GPS phone app, you could probably earn some revenue share income by offering hiking or outdoor-related items from the Amazon.com store to your customers. Your revenue-share in the Mobile Associates program varies depending on the category of the item sold, but you can use this API set to sell one item and never have the user exit the context of your app, or you can collect a rev-share on an entire shopping-cart of items that a user will purchase in the Amazon.com UI. Okay, these APIs don’t generate revenue directly, but they are so important to generating revenue I had to find a way to get them in this post. A|B Testing: Now you can test to see what makes more money in the real world. Have you ever wondered if placing an In-App-Purchase dialog box at the beginning of a level or at the end of a level would result in more revenue? Now you can find out which is actually best with real users. You can test any set of conditions and successes to find the combination that is most profitable for you. And you can change the variables and the mix without having to re-submit your app. (works on all Android app stores). GameCircle: The current version of GameCircle is free, and provides your users with saved game syncing, achievements, and leaderboards that work on most Android apps sold from any Android marketplace. The cross-store capability is nice, but the big take-away here is that games with GameCircle make 83% more average revenue per user than games that don’t. 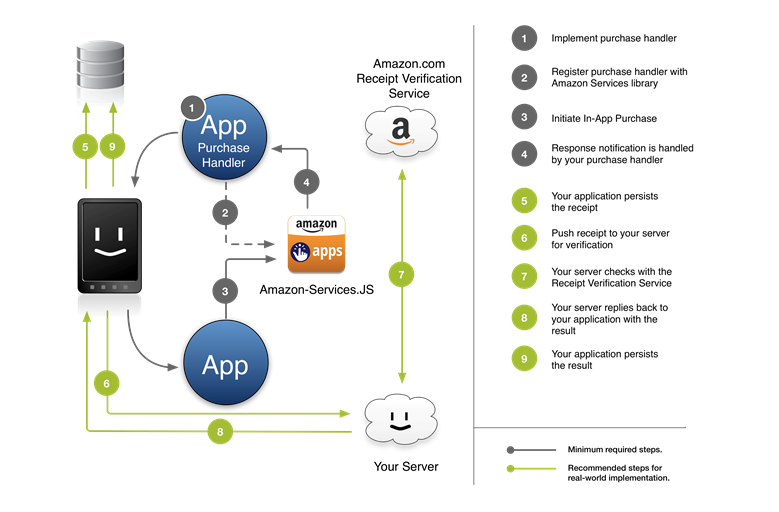 So it turns out that there are a lot of things Amazon is doing to help you make the most from your app (documentation for the APIs can be found in our dev portal here) It’s easy to start selling your apps on Amazon. Just click here to create a free account today. Until today, developers have only had three methods to monetize their apps or games: selling them outright, going “freemium” with in-app purchasing or subscriptions, or using mobile ads. Starting now, Amazon has created a new method for developers to monetize: the Amazon Mobile Associates API, currently available for Android (including Kindle Fire). The Mobile Associates API allows developers to sell real products from the millions of items at Amazon, whether physical (i.e. toys, clothing) or digital (i.e. eBooks), from inside their apps or games while earning up to 6% in advertising fees from those purchases. The Mobile Associates API is an extension of Amazon Associates, our successful web-based affiliate program created in 1996, paying advertising fees to hundreds of thousands of affiliates worldwide. Here’s how it works: a customer initiates a purchase from within your app and is then presented with a dialog box showing the product details and cost. The customer can then complete the purchase using Amazon’s 1-Click purchasing, and then the items will be shipped directly from Amazon to the customer’s doorstep. You’ll earn up to 6% of the total purchase, added to your app distribution earnings. Integration is simple. Initilize the Mobile Associates API, and tell us what you’re selling--you can choose to supply a specific set of ASINs (Amazon Standard Identification Number), search terms, or use the Amazon Product Advertising API to query a list of ASINs and product information. Then, initiate the purchase. We’ll take care of the rest! We’ve posted a Quick Start Guide, sample code, and documentation here—start earning more with the Amazon Mobile Associates API today! on September 17th, 2013 @ 10:00 AM. 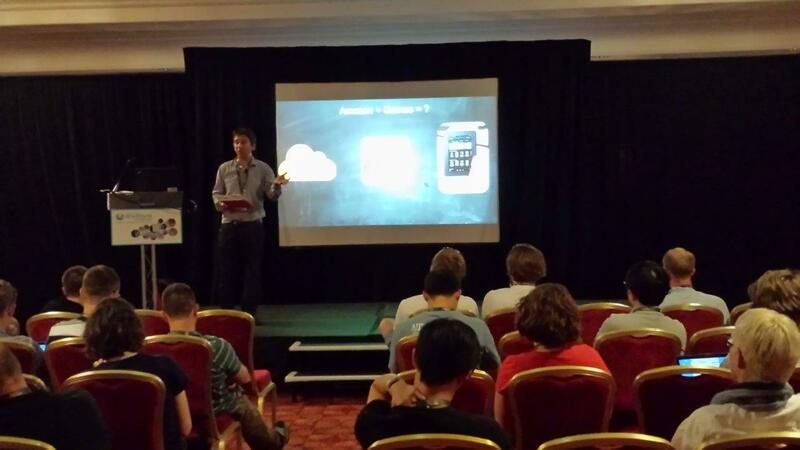 On July 9th, the Amazon Apps UK team was very pleased to present at Develop Brighton, one the leading events for the burgeoning UK games community, attended by over 1,600 games industry professionals from CEO’s to Student developers. On one of the hottest days of the year, Matt Hatherly from the UK Apps team and I enjoyed meeting so many games developers the Hilton Metropole, at the Hotel Du Vin and on Brighton’s famous beach. During our presentation we took the opportunity to share insights on how to develop, market and monetize mobile games that use In App Purchasing. 1. The more time you can keep customers engaged the more money you’ll make. 2. Finessing your range, selection and pricing of IAP items and the way you communicate to customers makes a big difference to monetization. Thousands of UK based game developers have added their Apps to the Amazon Appstore, including hit Freemium titles from Developers including New Star Games (New Star Soccer), Endemic ( Plague), Stick Sports (Stick Sports Cricket), and we look forward to welcoming many more to the store. The UK team will be participating in more Developer events during the course of the year and we hope to connect with more of the UK Games community then. There is only one more setup task now that the Unity environment has Amazon In-App Purchasing available and the application specifies this support in its manifest. As a developer, you need to set up your sandboxed test environment for running in-app purchasing transactions. 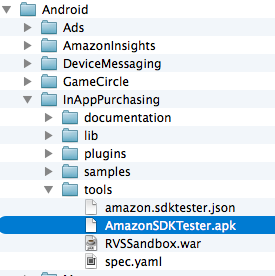 This means you install the AmazonSDKTester.apk from the Amazon Mobile App SDK on your emulator or device and provide a JSON file detailing your IAP items. More details on setting up your test environment can be found here. The string “com.gravestompers.characters.ghostface” is the SKU of the Ghostface IAP item specified on the Mobile App Distribution Portal along with being defined in the JSON file for testing. These places are where you also specify things such as the type of in-app item (consumable, entitlement, or subscription), price, title, and description. Now with the purchase flow being in place and the user actually able to make a purchase, code is required for handling the result of the purchase flow and providing the user with the actual Ghostface character. The response for this purchase flow will be returned via the AmazonIAPEventListener methods: purchaseFailedEvent and purchaseSuccessfulEvent. Below is an example of what Mad Menace Games’ code may look like for this. As a best practice, we recommend validating the receipt you receive from a successful purchase via your server that stores these receipts. More information on validation of receipts can be found here. 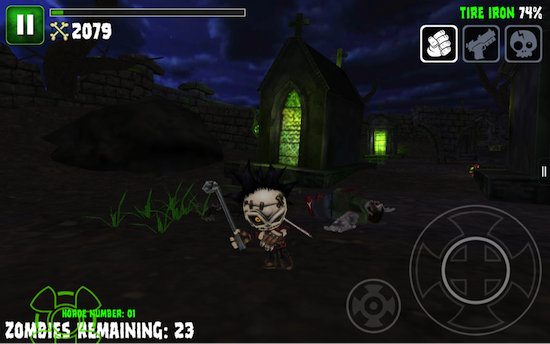 That is all it took for Mad Menace Games to add Amazon In-App Purchasing support to their GraveStompers Unity game. You can find more information on Amazon In-App Purchasing and the Unity plug-in here.